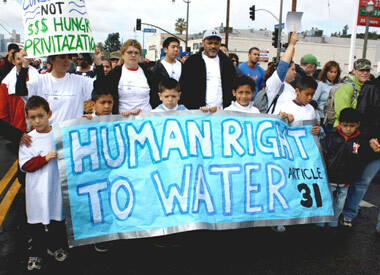 Does The Human Right to Water and Sanitation = Water and Sanitation Justice? Has anyone ever asked you “What do you do?” An interesting philosophical question for sure, but one of my condensed answers often is “I work for water justice and sanitation justice.” This means I want to participate in a more just water and sanitation world on individual, community, and political scales. In 2010, the UN General Assembly and the Human Rights Council officially adopted The Human Right to Water and Sanitation resolutions. These resolutions represented the emergence of an international legal framework to recognize water and sanitation (WatSan) as a human right through availability, quality, acceptability, accessibility, and affordability. In my mind, this consecrated right was also a potential catalyst for a more just WatSan world. But I had never stepped back to ponder why the right to WatSan might seem equivalent to WatSan justice until I read an insightful paper called Forests, development, and the globalisation of justice by Forsyth and Sikor. Their paper provides a background on the historical connection of rights and justice concepts and challenges readers to evaluate universal notions of such. Here’s a quick history on the right to WatSan as documented on the great The Rights to Water and Sanitation website. In 1948, close to 50 states agreed in the UN General Assembly to sign a Universal Declaration of Human Rights which identified about 30 rights: the right to education, the right to a standard of living for adequate health, and so forth. This Declaration led to multi-national treaties, national constitutions, and national laws. In 1966, two legally binding treaties identified a right to life and right to health which inferred WatSan were necessary to human life. In 2002, a UN committee issued a comment on the International Covenant on Economic, Social and Cultural Rights saying “The human right to water is indispensable for leading a life in human dignity. It is a prerequisite for the realization of other human rights.” Finally, Special Rapporteur Catarina de Albuquerque was appointed in 2008 to work with civil society organizations and states to identify best practices for WatSan, clarify the legality of WatSan human rights, and make recommendations towards MDG 7C. It was likely her work, along with a proposal from Bolivia, that forwarded the adoption of UN General Assembly Resolution 64/292 in July 2010 “calling on states and international organizations to provide financial resources, build capacity and transfer technology, particularly to developing countries, in scaling up efforts to provide safe, clean, accessible and affordable drinking water and sanitation.” There were 122 states voting for the resolution, 0 against, and 41 abstentions (including the United States). The UN Human Rights Council passed an updated resolution the next year. But will this universal human right to WatSan lead to a more just WatSan world? ← Communicating water science to policymakers: are we missing the point?